This math puzzle 7 is on largest number,fraction,consecutive numbers etc. 1) Three numbers are in the ratio of 3:4:5 respectively. If the sum of the first and third numbers is more than the second number by 52, then which will be the largest number? 2) In New York, the fare for a taxi ride is paid according to a meter. However, since the meters are of old manufacture and are not up to date on current prices, the passenger is required to pay one and half times what the meter reads. In addition, after 10pm there is a night charge, which is calculated on the adjusted total (i.e. the meter + half). If Sam and Alley want to go to a late night costume party by taxi, what fraction of the meter reading will they have to pay in total? 3) Glass A contains 100ml of water and glass B contains 100ml of wine. A 10 ml spoonful of wine is taken from glass B and mixed thoroughly with water in glass A. A 10 ml spoonful of the mixture from A is returned to B. Is there now more wine in water or more water in wine? Convert the fractions into decimals. 5) There are three consecutive numbers a, b and c. The differences between the squares of these numbers are two consecutive prime numbers. If b2 is 5 more than a2 and a = 2 ,find b and c.
6) Alley invested a sum of money in shares. After three years she received $12100, which was the original sum. Sam heard about this and decided to invest half of what Alley had invested. How much did Sam get after 3 years? 7) Alley and Sam had a fight, so Sam buried Alley’s coin collection in his grandfather’s compound. He then drew a map so that he could find it when he wanted to. The coins were buried in an earthen pot to the south of the pond. It was at a distance of the third power of three-fourth the distance from the centre of the pond to the palm to the east. The map is given below. 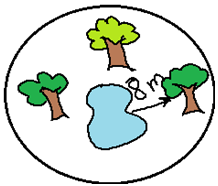 Find the distance from the centre of the pond where the treasure is buried. 8) Alley has given Sam a problem: The fourth power of a number is equal to the square of another number. If the square is 256 find the two numbers. Sam started off enthusiastically but then got stuck. Can you help him find the numbers? 10) A farmer has a large orchard where he grows apple trees. He usually sells his apples for $14.50 per kg. this year, however, a violent hailstorm ruins 3/8 of his crop. How much will he have to sell apples for if he wishes to make the same profit?